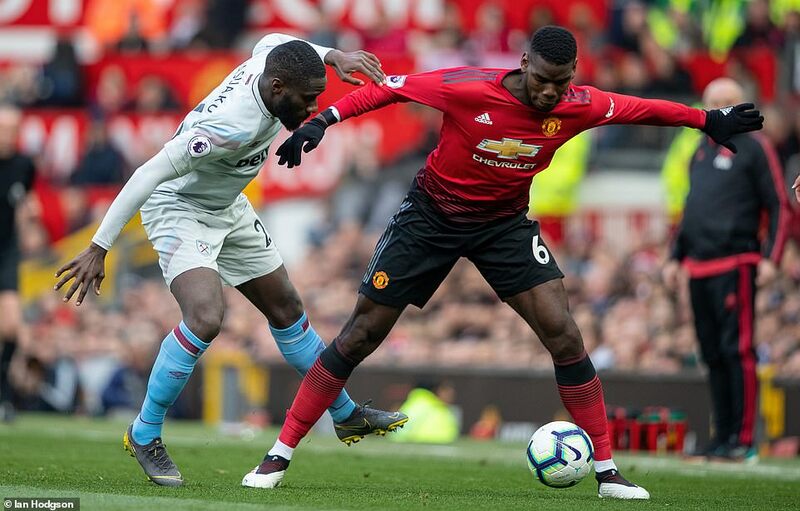 Paul Pogba abandoned his trademark run-up to twice score from penalties and give Manchester United’s’ Champions League hopes a boost at the expense of unlucky West Ham. 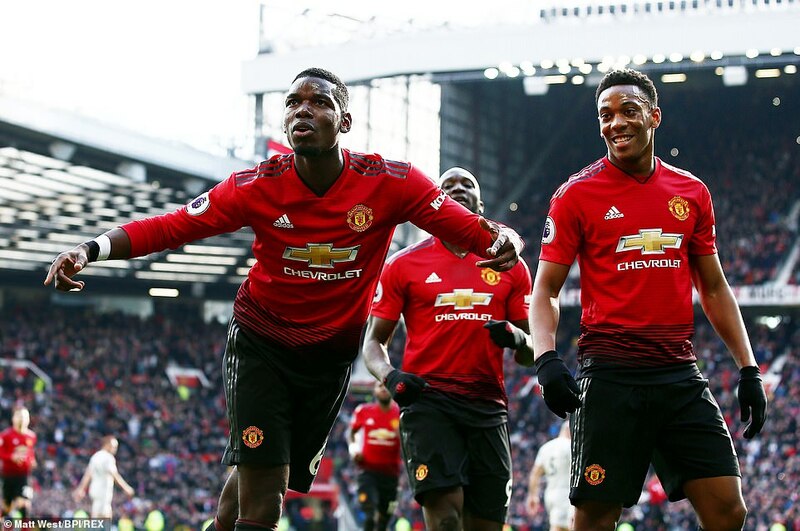 Pogba, who usually stutters his steps on the way to the ball, decisively converted both his spot-kicks past Lukasz Fabianski without any delay or hesitation to move United to within two points of fourth-place Chelsea who play at Liverpool on Sunday. 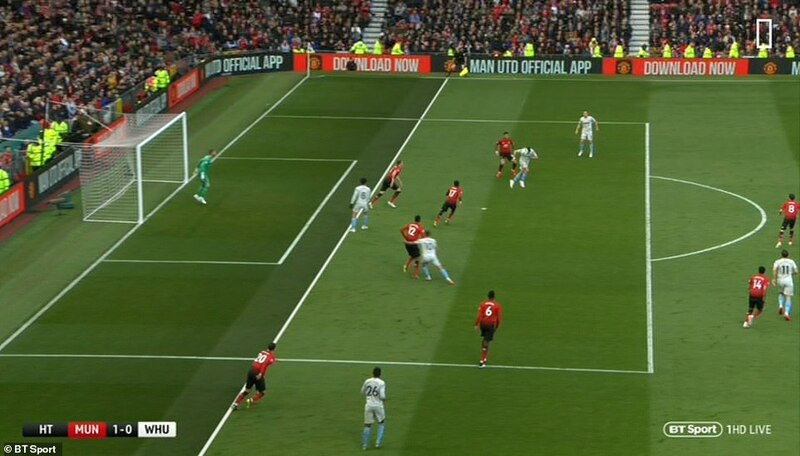 But West Ham were aggrieved that an early strike by Felipe Anderson was incorrectly ruled out for offside and Pogba’s first penalty was harshly awarded for a foul by Robert Snodgrass on Juan Mata. Declan Rice (No 41) starts off a brilliant West Ham passing move before Felipe Anderson (No 8) equalises minutes after the restart. For more of Sportsmail’s fantastic MATCH ZONE feature, click here. 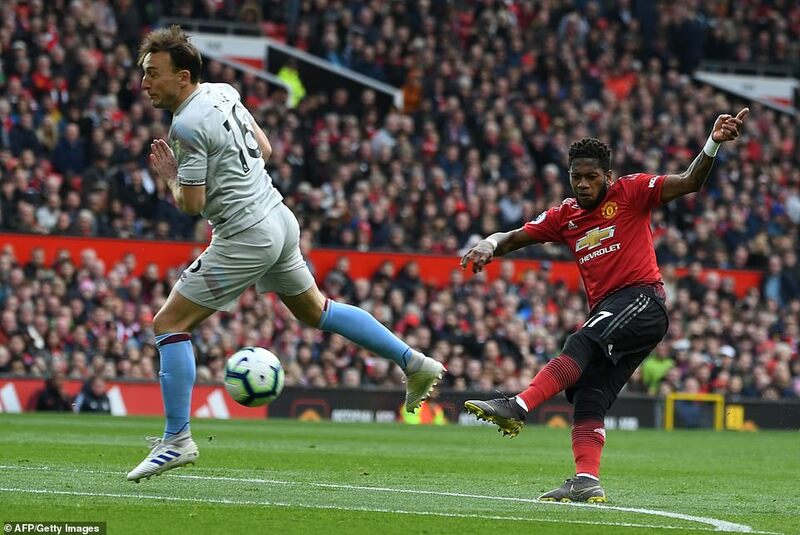 Their feelings of injustice only intensified after Anderson had equalised early in the second half with substitute Michail Antonio hitting the crossbar and then denied by a worldie save by David De Gea with the score at 1-1. With an unseasonal chill in the Old Trafford air, Pogba and Romelu Lukaku opted to wear gloves for the Saturday evening kick off. Victor Lindelof and Marcus Rashford were benched by Ole Gunnar Solskjaer with Barcelona on Tuesday night in mind while West Ham included United target Declan Rice but no Marco Arnautovic. United hadn’t lost at Old Trafford in the league since August and need their home form to count to in a bid for the top four. West Ham looked ideal opponents on paper – without an away win in 2019 and having lost their last three without scoring. 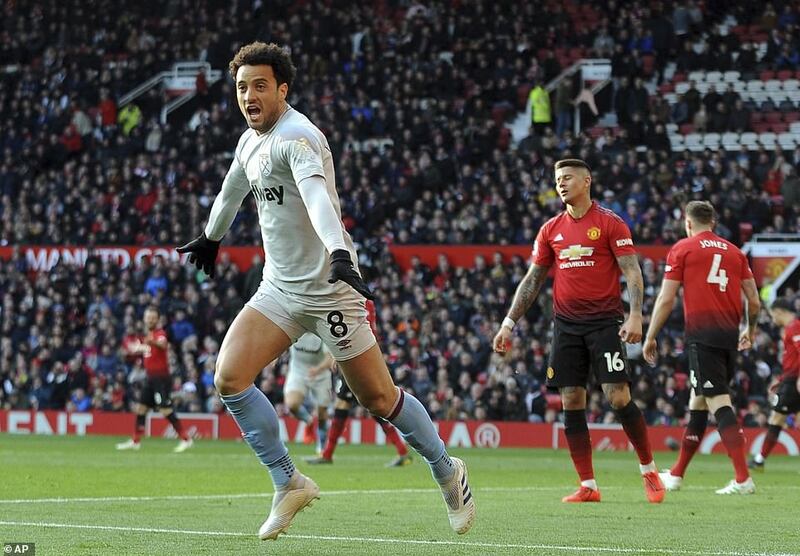 Felipe Anderson thought he’d ended the run when he acrobatically sent a half-volley past United captain David de Gea after 11 minutes only to have his celebrations cut short by the assistant’s flag for offside – thought replays showed Diego Dalot’s outstretched leg was just playing him on. 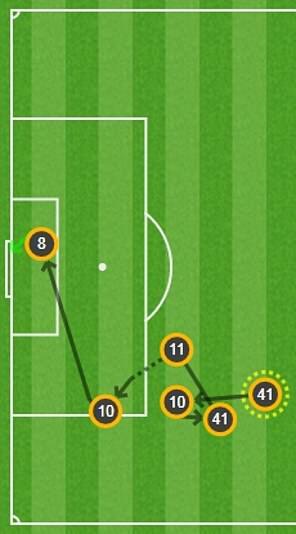 United’s good fortune extended for the opening goal after 18 minutes. 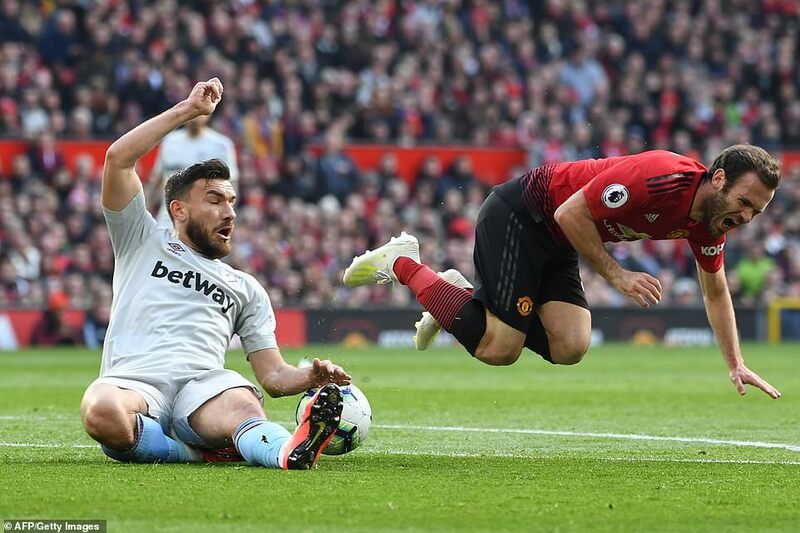 Juan Mata was knocked over by West Ham’s Robert Snodgrass on the penalty area line but visitors skipper Mark Noble led the complaints it was a fair shoulder charge. 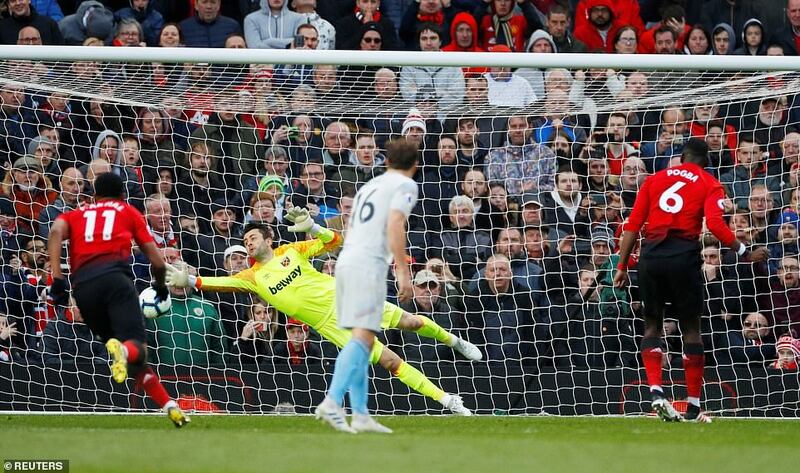 Either way, Pogba thumped the penalty past Lukasz Fabianski without a stutter. It was the midfielder’s first United goal in nine matches that included a penalty miss against Southampton when his 13 steps in the run-up failed to outsmart goalkeeper Angus Gunn. 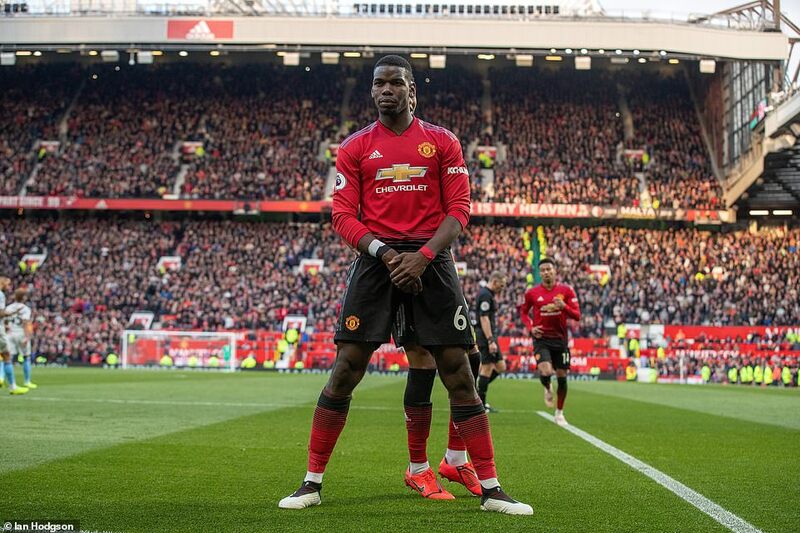 Overall, Pogba has now scored seven of his 10 spot-kicks this season. West Ham are the epitome of mid-table – in no danger of relegation yet too far adrift of a European place. But at least they showed willing for manager Manuel Pellegrini, who experienced many bigger Old Trafford occasions when he was in charge of Manchester City. Snodgrass tried to make amends for conceding a penalty with a wicked delivery from his corner after 25 minutes which Anderson sent narrowly wide with a flicked header. 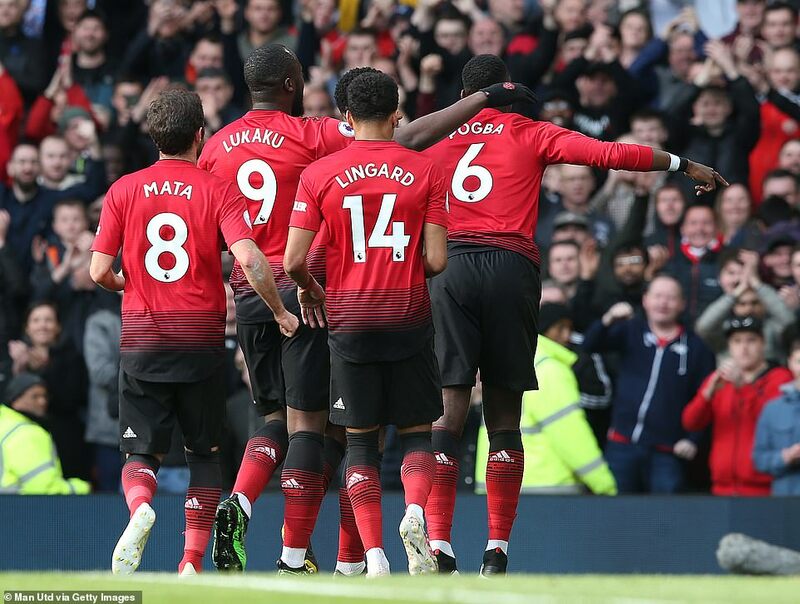 United, who have Everton, City and Chelsea in their next three league fixtures before finishing off with more-comfortable looking games against Cardiff and Huddersfield, tried to kill of West Ham by scoring a second before half-time and Lukaku had a shot that deflected and span wide. 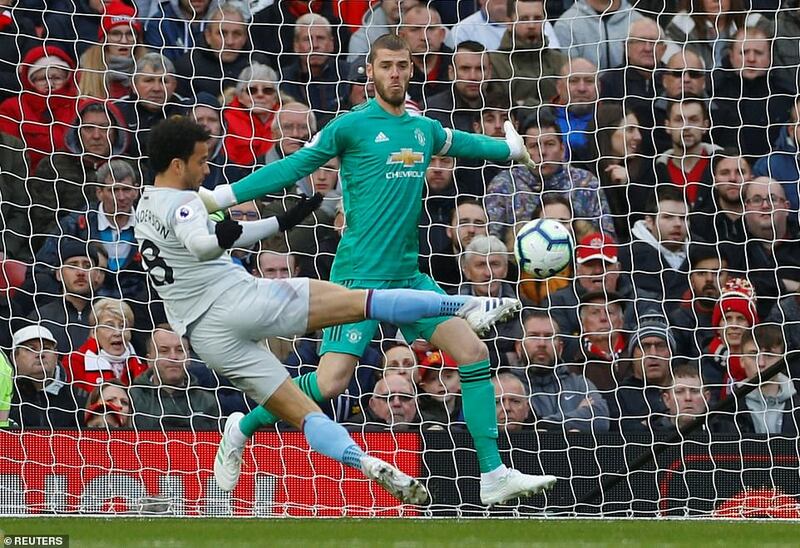 But it was West Ham who still mustered the last chance of the first half, De Gea saving with his feet when Anderson tried his luck from an acute angle. 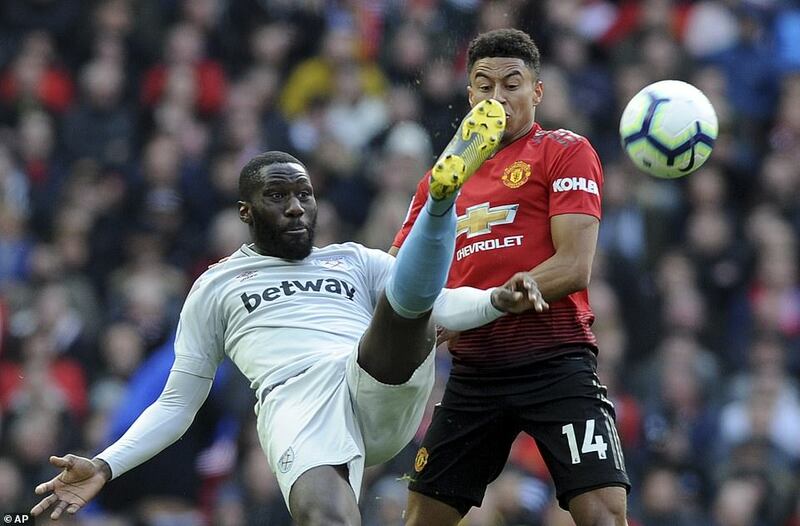 Many of West Ham’s best moments came down Manchester United’s left flank where Marcos Rojo was deputising for Ashley Young – the Argentine’s first start of an injury-hit year. Pellegrini registered his displeasure to the officials during the interval and within four minutes of the restart his side were level. The goal was of United’s making. De Gea rolled a ball out to Pogba that wasn’t fully accurate and that the Frenchman reacted slowly to. 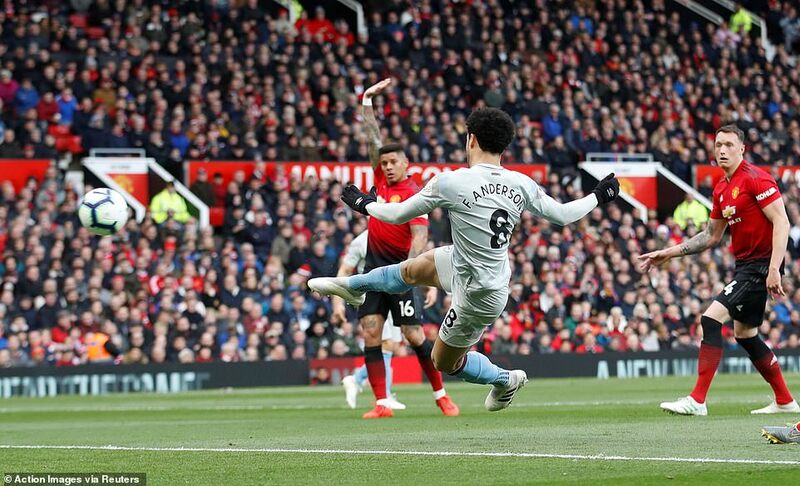 Snodgrass intercepted and released Manuel Lanzini whose clever cross was steered home by Anderson from close range while De Gea stayed rooted to his line. 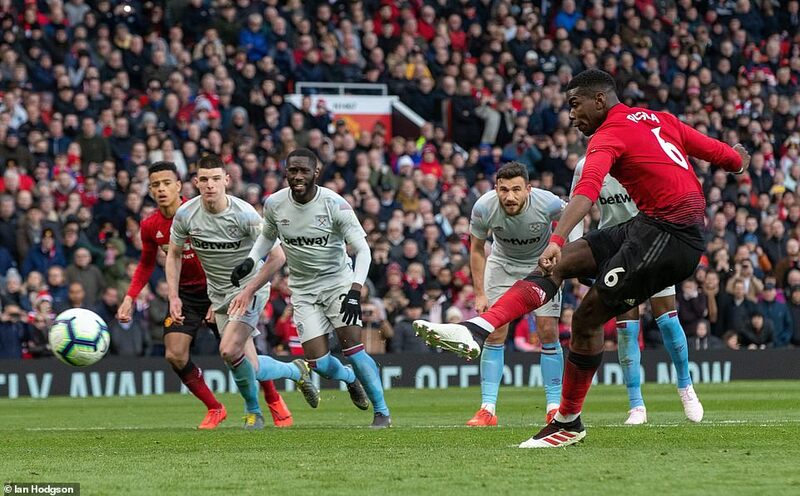 It was nothing less than West Ham deserved and they nearly went ahead when Pablo Zabaleta tested De Gea – forcing Ole Gunnar Solskjaer to introduce Rahsford for Juan Mata with 35 minutes still left. 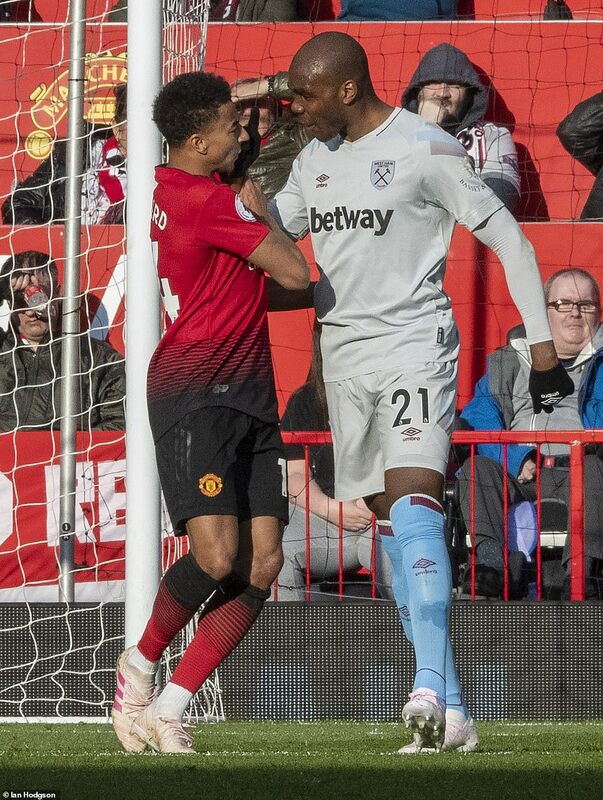 Rashford was in immediate action, forcing Fabianski into a wonderful one-handed save and then heading over the bar after a sustained period of aerial pinball around the West Ham box. 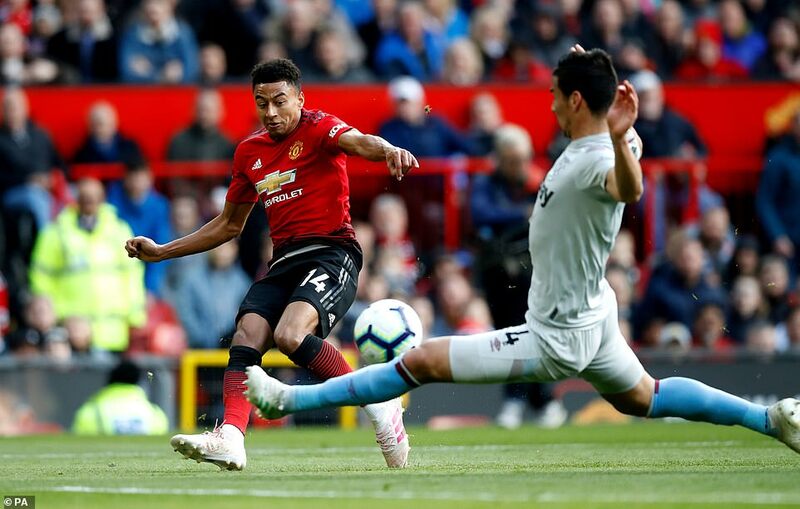 Rojo, who scored a vital winner for Argentina at the World Cup last summer, powered forward from left-back and also tested Fabianski as United finally moved up the gears. In contrast, West Ham seemed affected by the loss of Lanzini who limped out just after the hour mark though the deliveries from Snodgrass at set pieces always caused United problems. Pellegrini sent on Michail Antonio for “Chicharito” Hernandez after 72 minutes and it was nice to hear United fans give a warm ovation to their former striker as he trudged off. 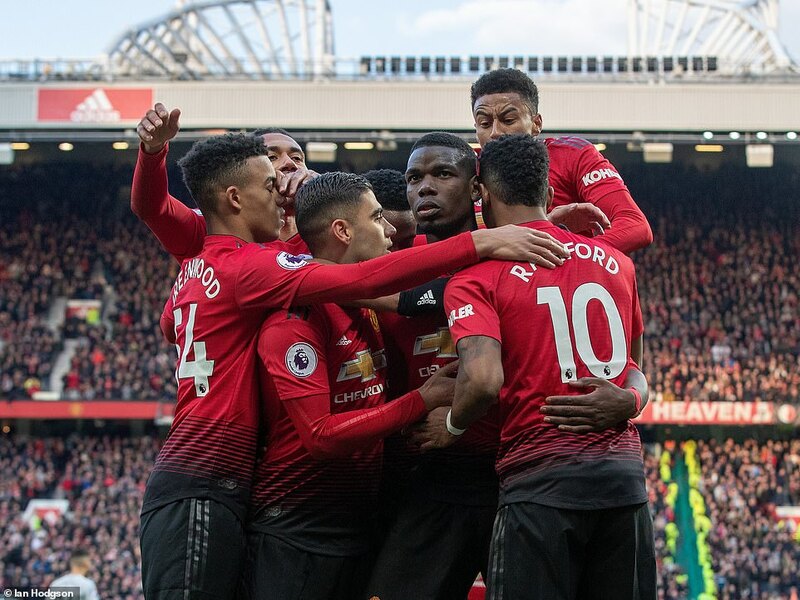 Solskjaer was so worried by his team’s showing he then made a final double change for the final 15 minutes – throwing on Andreas Pereira and teenager Mason Greenwood of whom a lot is expected in future years. Lukaku was one of those replaced to rest his legs for the Nou Camp. No sooner had they been introduced than Antonio twice came desperately close to putting West Ham in front. 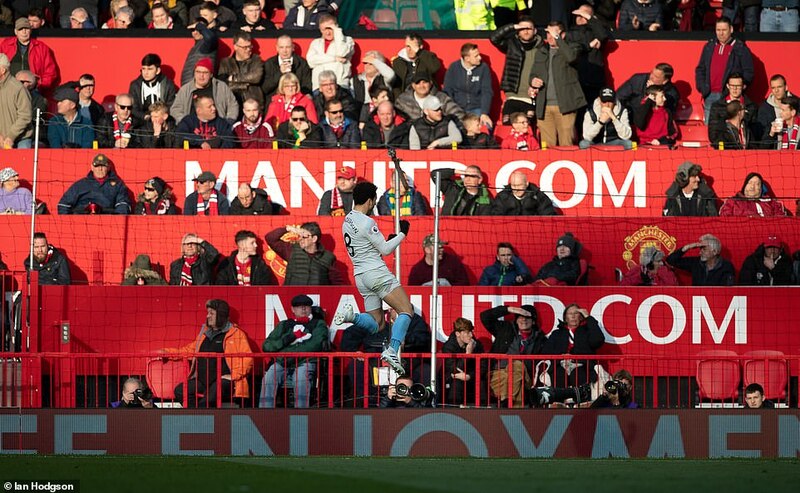 First, he cut inside the United backline before thumping a shot against the United crossbar. Then he thought he’d scored with a downward header that De Gea somehow clawed away in a style reminiscent of Gordon Banks’ save from Pele. Having rode their luck, United then struck themselves after 79 minutes. 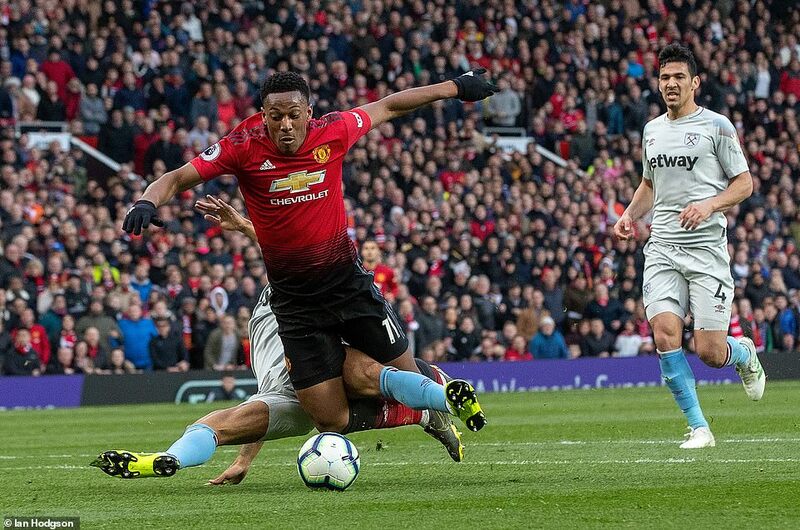 Anthony Martial sprinted clear and though a chasing Ryan Fredericks claimed he nicked the ball with a tackle from behind, he also got enough of the Frenchman for Mr Scott to signify a penalty. 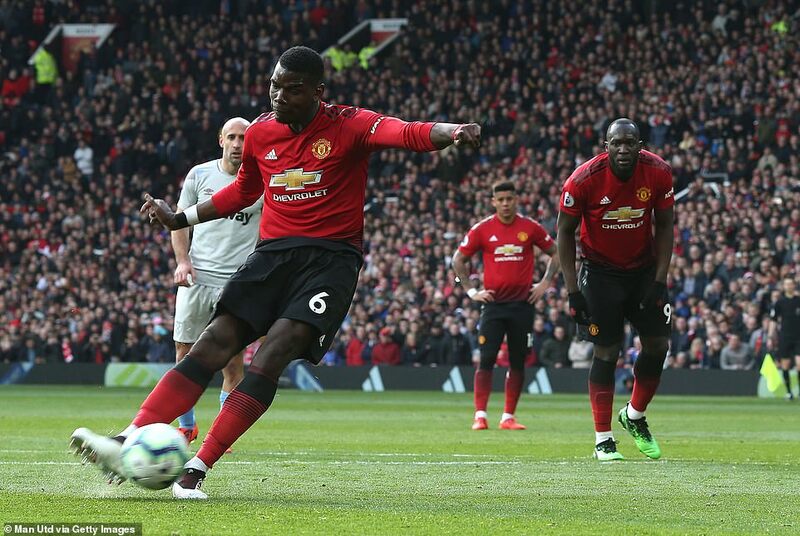 For the second time, a no-nonsense Pogba ran straight up to the ball and smashed it home, this time in the bottom left-hand corner.